June – a month for grads and for brides and grooms, and for some young lovers, a month for all three. Such was the case for John Huff, 18, and Mildred Ruggles, 17, Oak Park High School graduates in June 1919. Their affection for each other was chronicled in their high school yearbook, the Tabula, and in the pages of the Chicago Tribune that month. The newlyweds lived in Oak Park for many years before moving to Fort Lauderdale. He was a radio and later television service technician. She was a homemaker and mother to their daughter Barbara. The couple were married until her death in 1964. He died less than a year and a half later at age 64. 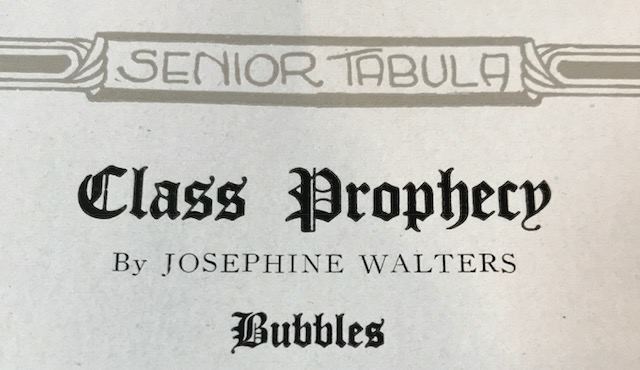 Their Tabula prophecy bubble may have been dim, but it took 45 years to break.